This sketch was created, as a demonstration, during the 2015 Africa Geographic Art Safari in Kariega Game Reserve, South Africa. It was a cloudy day and we were watching a lion pride, when suddenly a mother warthog and her brood came trotting out of the bush, straight at the lions. One of the lionesses gave chase and they all disappeared, only to reappear a few seconds later, clattering down the track, with the lioness on the tail of one of the piglets. The chase ended in success for the lioness, but the male lion soon appeared to steal the kill from her. After the commotion died down, they all emerged from the bushes and lay in the open, where this sketch was created. The watercolor was added back at camp, as a demonstration of how I add color to my pencil sketches. It was an exciting start to our Art Safari! The Original Field Sketch is watercolor & pencil on watercolor paper, 11×14″, priced at US$300. Limited Edition Giclées are available, priced at US$120 each. Only 10 copies are available, printed using archival inks on watercolor paper, 14×11″, all signed and numbered by me. Tomorrow’s sketch is of a pack of painted dogs. 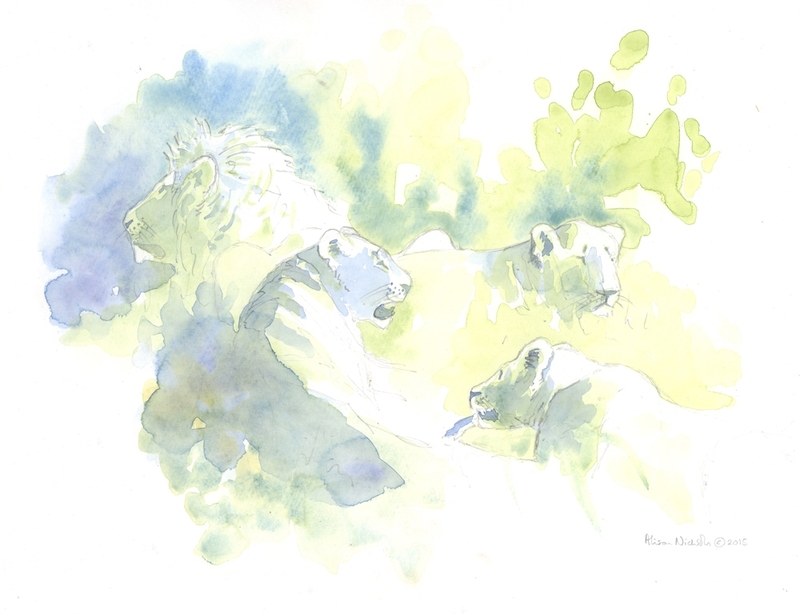 This entry was posted in African Wildlife, Art Safaris, Big Cats, Blog Posts, Field Sketches, For Artists, Watercolors, Workshops and tagged alison nicholls art, lion art, lion pride, lion sketch, lion watercolor on November 20, 2015 by Alison.